The CIE 1976 (L*, a*, b*) color space (CIELAB), showing only colors that fit within the sRGB gamut (and can therefore be displayed on a typical computer display). Each axis of each square ranges from −128 to 128. CIELAB colors are defined relative to the white point of the CIEXYZ space from which they were converted; thus CIELAB values do not define absolute colors unless the white point is also specified. Often, in practice, the white point is assumed to follow a standard and is not explicitly stated (e.g., for "absolute colorimetric" rendering intent, the International Color Consortium L*a*b* values are relative to CIE standard illuminant D50, while they are relative to the unprinted substrate for other rendering intents). The lightness correlate in CIELAB is calculated using the cube root of the relative luminance. An example of color enhancement using LAB color mode in Photoshop. The left side of the photo is enhanced, while the right side is normal. Unlike the RGB and CMYK color models, Lab color is designed to approximate human vision. It aspires to perceptual uniformity, and its L component closely matches human perception of lightness, although it does not take the Helmholtz–Kohlrausch effect into account. Thus, it can be used to make accurate color balance corrections by modifying output curves in the a and b components, or to adjust the lightness contrast using the L component. In RGB or CMYK spaces, which model the output of physical devices rather than human visual perception, these transformations can be done only with the help of appropriate blend modes in the editing application. Because the Lab space is larger than the gamut of computer displays and printers and because the visual stepwidths are relatively different to the color area, a bitmap image represented as Lab requires more data per pixel to obtain the same precision as an RGB or CMYK bitmap. In the 1990s, when computer hardware and software were limited to storing and manipulating mostly 8-bit/channel bitmaps, converting an RGB image to Lab and back was a very lossy operation. With 16-bit/channel and floating-point support now common, the loss due to quantization is negligible. CIELAB is copyright and licence-free: as it is fully mathematically defined, the CIELAB model is public domain, it is in all respects freely usable and integrable (also systematic Lab / HLC color value tables). A big portion of the Lab coordinate space cannot be generated by spectral distributions, it therefore falls outside the human vision and such Lab values are not "colors". Some specific uses of the abbreviation in software, literature etc. In Adobe Photoshop, image editing using "Lab mode" is CIELAB D50. In Affinity Photo, Lab editing is achieved by changing the document's Colour Format to "Lab (16 bit)"
In ICC profiles, the "Lab color space" used as a profile connection space is CIELAB D50. In TIFF files, the CIELAB color space may be used. In PDF documents, the "Lab color space" is CIELAB. 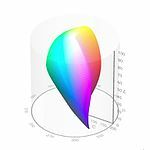 In Digital Color Meter on macOS, it is described as "L*a*b*"
In the open source non-destructive-editing software RawTherapee, the "Lab color space" is CIELAB. The sRGB gamut (left) and visible gamut under D65 illumination (right) plotted within the CIELAB color space. a and b are the horizontal axes; L is the vertical axis. CIE L*a*b* (CIELAB) is a color space specified by the International Commission on Illumination (French Commission internationale de l'éclairage, hence its CIE initialism). It describes all the colors visible to the human eye and was created to serve as a device-independent model to be used as a reference. The three coordinates of CIELAB represent the lightness of the color (L* = 0 yields black and L* = 100 indicates diffuse white; specular white may be higher), its position between red/magenta and green (a*, negative values indicate green while positive values indicate magenta) and its position between yellow and blue (b*, negative values indicate blue and positive values indicate yellow). The asterisk (*) after L, a and b are pronounced star and are part of the full name, since they represent L*, a* and b*, to distinguish them from Hunter's L, a, and b, described below. Since the L*a*b* model is a three-dimensional model, it can be represented properly only in a three-dimensional space. Two-dimensional depictions include chromaticity diagrams: sections of the color solid with a fixed lightness. It is crucial to realize that the visual representations of the full gamut of colors in this model are never accurate; they are there just to help in understanding the concept. Because the red-green and yellow-blue opponent channels are computed as differences of lightness transformations of (putative) cone responses, CIELAB is a chromatic value color space. A related color space, the CIE 1976 (L*, u*, v*) color space (a.k.a. CIELUV), preserves the same L* as L*a*b* but has a different representation of the chromaticity components. CIELAB and CIELUV can also be expressed in cylindrical form (CIELCH and CIELCHuv, respectively), with the chromaticity components replaced by correlates of chroma and hue. Since CIELAB and CIELUV, the CIE has been incorporating an increasing number of color appearance phenomena into their models, to better model color vision. These color appearance models, of which CIELAB is a simple example, culminated with CIECAM02. This topic is covered in more detail at Color difference. The nonlinear relations for L*, a*, and b* are intended to mimic the nonlinear response of the eye. 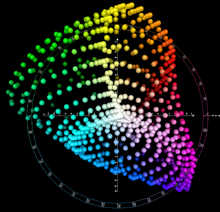 Furthermore, uniform changes of components in the L*a*b* color space aim to correspond to uniform changes in perceived color, so the relative perceptual differences between any two colors in L*a*b* can be approximated by treating each color as a point in a three-dimensional space (with three components: L*, a*, b*) and taking the Euclidean distance between them. There are no simple formulas for conversion between RGB or CMYK values and L*a*b*, because the RGB and CMYK color models are device-dependent. The RGB or CMYK values first must be transformed to a specific absolute color space, such as sRGB or Adobe RGB. This adjustment will be device-dependent, but the resulting data from the transform will be device-independent, allowing data to be transformed to the CIE 1931 color space and then transformed into L*a*b*. As mentioned previously, the L* coordinate ranges from 0 to 100. The possible range of a* and b* coordinates is independent of the color space that one is converting from, since the conversion below uses X and Y, which come from RGB. Here, Xn, Yn and Zn are the CIE XYZ tristimulus values of the reference white point (the subscript n suggests "normalized"). and where δ = 6/29. The Hunter Lab color space, defined in 1948 by Richard S. Hunter, is another color space sometimes referred to as "Lab". Like CIELAB, it was also designed to be computed via simple formulas from the CIEXYZ space but to be more perceptually uniform than CIEXYZ. Hunter named his coordinates L, a, and b; the CIELAB space, defined years later in 1976, named its coordinates L*, a*, and b* to distinguish them from Hunter's coordinates. where Ka is a coefficient that depends upon the illuminant (for D65, Ka is 172.30; see approximate formula below) and Xn is the X tristimulus value of the specified white object. where Kb is a coefficient that depends upon the illuminant (for D65, Kb is 67.20; see approximate formula below) and Zn is the Z tristimulus value of the specified white object. Both a and b will be zero for objects that have the same chromaticity coordinates as the specified white objects (i.e., achromatic, grey, objects). which result in the original values for Illuminant C, the original illuminant with which the Lab color space was used. which is identical to the Hunter Lab formulas given above if we select K = Ka/100 and ke = Kb/Ka. Therefore, the Hunter Lab color space is an Adams chromatic valence color space. The sRGB gamut (left) and visible gamut under D65 illumination (right) plotted within the CIELCHab color space. L is the vertical axis; C is the cylinder radius; h is the angle around the circumference. 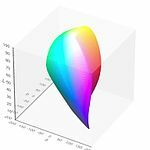 The CIELCh color space is a CIELab cube color space, where instead of Cartesian coordinates a*, b*, the cylindrical coordinates C* (chroma, relative saturation) and h° (hue angle, angle of the hue in the CIELab color wheel) are specified. The CIELab lightness Lab* remains unchanged. The LCh color space is not the same as the HSV, HSL or HSB color models, although their values can also be interpreted as a base color, saturation and lightness of a color. The HSL values are a polar coordinate transformation of what is technically defined RGB cube color space. LCh is still perceptually uniform. Further, H and h are not identical, because HSL space uses as primary colors the three additive primary colors red, green, blue (H = 0, 120, 240°). Instead, the LCh system uses the four colors yellow, green, blue and red (h = 90, 180, 270, 360°). Regardless the angle h, C = 0 means the achromatic colors, that is, the gray axis. The simplified spellings LCh, LCH and HLC are common, but the latter presents a different order. 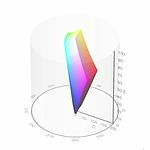 HCL color space (Hue-Chroma-Luminance) on the other hand is a commonly used alternative name for the L*C*h(uv) color space, also known as the cylindrical representation or polar CIELUV. ^ a b International Color Consortium, Specification ICC.1:2004-10 (Profile version 4.2.0.0) Image technology colour management — Architecture, profile format, and data structure, (2006). ^ Margulis, Dan (2006). Photoshop Lab Color: The Canyon Conundrum and Other Adventures in the Most Powerful Colorspace. Berkeley, Calif. : London: Peachpit ; Pearson Education. ISBN 0-321-35678-0. ^ Adobe Acrobat Reader 4.0 User Guide "The color model Acrobat Reader uses is called CIELAB…"
^ "Lab Adjustments - RawPedia". rawpedia.rawtherapee.com. Retrieved 2018-05-08. ^ 3D representations of the L*a*b* gamut, Bruce Lindbloom. ^ Fairchild, Mark D. (2005). "Color and Image Appearance Models". Color Appearance Models. John Wiley and Sons. p. 340. ISBN 0-470-01216-1. ^ Jain, Anil K. (1989). Fundamentals of Digital Image Processing. New Jersey, United States of America: Prentice Hall. pp. 68, 71, 73. ISBN 0-13-336165-9. ^ János Schanda (2007). Colorimetry. Wiley-Interscience. p. 61. ISBN 978-0-470-04904-4. ^ Hunter Labs (1996). "Hunter Lab Color Scale". Insight on Color 8 9 (August 1–15, 1996). Reston, VA, USA: Hunter Associates Laboratories. ^ Adams, E.Q. (1942). "X-Z planes in the 1931 I.C.I. system of colorimetry". JOSA. 32 (3): 168–173. doi:10.1364/JOSA.32.000168. 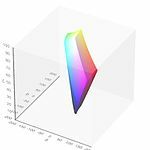 CIELAB Color Space by Gernot Hoffmann, includes explanations of L*a*b* conversion formulae, graphical depictions of various gamuts plotted in L*a*b* space, and PostScript code for performing the color transformations.